Factom continues to make gains as the rest of the blockchain space capitulates. The market has grown by over 224% over the past 30 trading days. Support moving forward: $14.00, $13.33, $11.49, $10.00, $9.65, $8.00, $7.04, $5.48. Resistance moving forward: $17.27, $19.21, $20.00, $21.61, $22.87, $24.68. 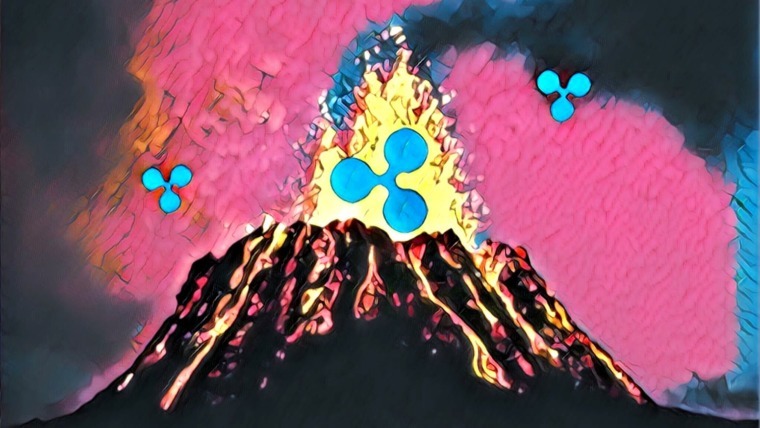 November 2018 has been an extremely disastrous month for the entire cryptocurrency industry as the entire market collapsed by over 50% for each individual coin. 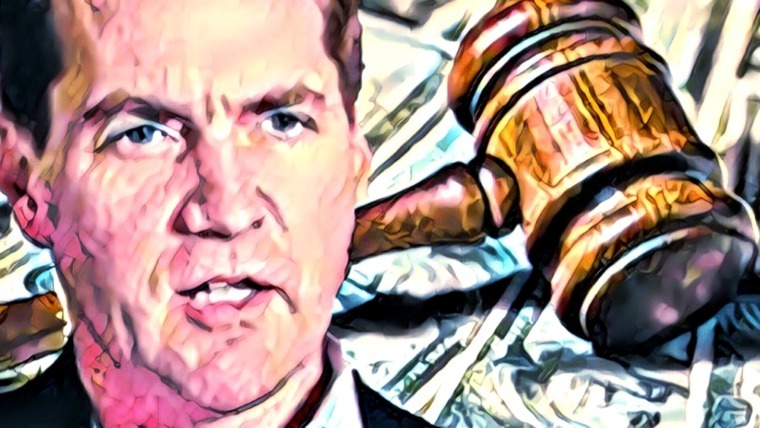 Against all odds, Factom has continued to gain heavily against Bitcoin and the USD as the market gained over 280% from low to high in November 2018. 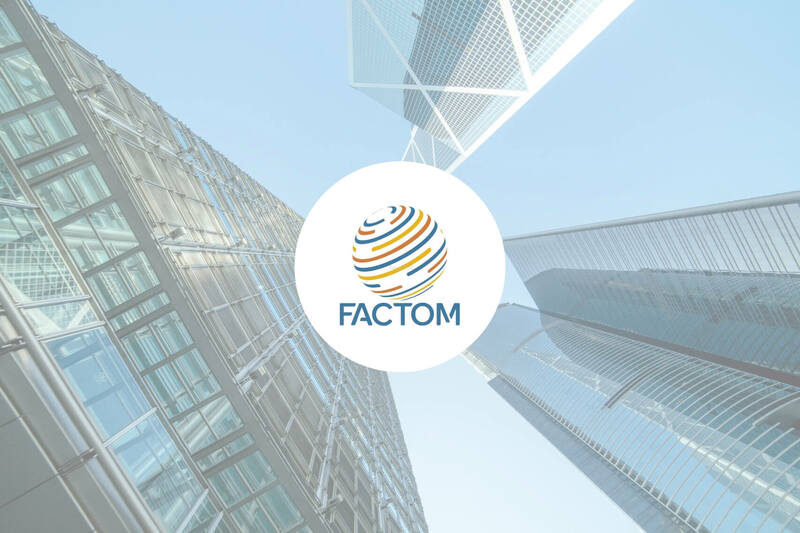 This has largely been attributed to the overwhelming number of partnerships that Factom has managed to accumulate throughout the year, along with their continued development. Factom has continued along its planned journey to bring full decentralization to its blockchain. At the start of the year, all the nodes were run solely in Factom’s possession. However, as time has progressed, the community has appointed 5 Guides and 25 ANOs (Authority Node Operators) who collectively run 2 nodes. The team’s goal is to reach 65 ANOs in the following months. The ANOs and Guides help to maintain the integrity of the blockchain and receive Factoids as an incentive to remain honest. The ANOs are particularly heavily invested in Factom and some are even developing open-source and commercial solutions to bring adoption to the ecosystem. One of the outstanding examples comes from the development company known as Off-blocks who are developing a mobile app for digital identity. But it’s their partnerships that seem to be the main driving force behind the growing interest in Factom. The team has secured a partnership with a Vietnam-based IT company, FPT, who employs over 30,000 people worldwide. 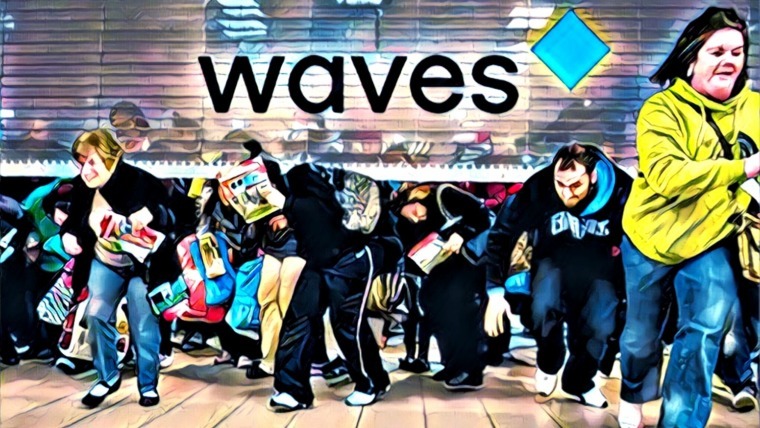 They are also the only blockchain company to progress to the final stages of the Department of Homeland Security Innovation program to help secure IoT data. Perhaps the most significant development is their new partnership with Equator, a leading provider of residential loan default software for real estate agents and vendors. Equator would like to integrate Factom’s Harmony BaaS into their Equator PRO real estate software. It is likely that this news has been the main driving force behind the epic rise for Factom during November 2018. Factom has seen a 3.48% price increase over the past 24 hours of trading as the cryptocurrency presently is exchanging hands at a price of $15.35. 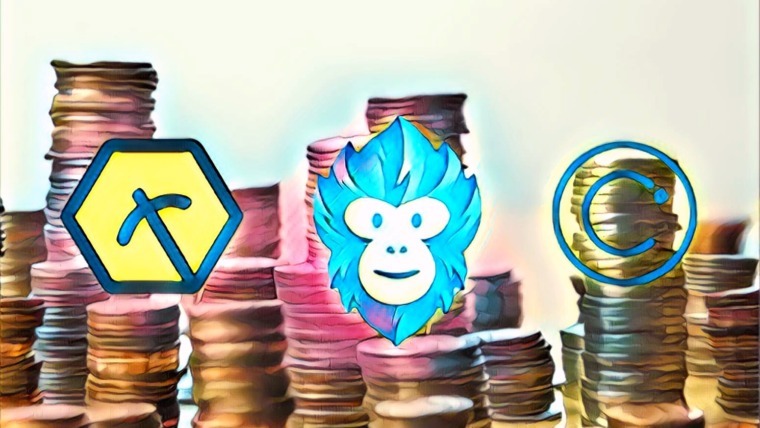 The cryptocurrency has seen a remarkable 44% increase in price over the past 7 trading days and an extraordinary 224% increase in price over the past 30 trading days. Factom is now ranked in 36th position in terms of overall market cap value and holds a $134 million market cap value. 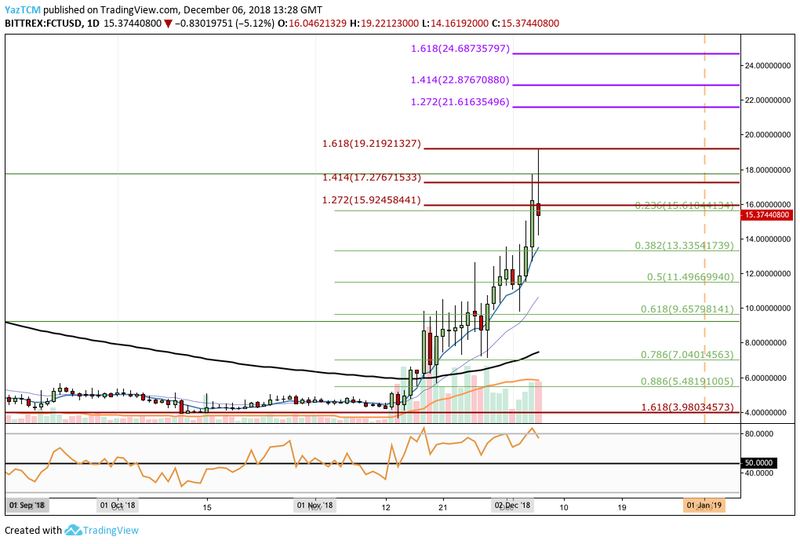 Analyzing FCT/USD price action from the short-term perspective above, we can see that Factom was trading around the $4 handle before experiencing this epic rise. The market had found support at a downside 1.618 Fibonacci Extension level (drawn in red) priced at $3.98 which had prevented FCT/USD from dropping further below. We can clearly see the impact on the market after the announcement was made on November 12 2018, as price action has proceeded to rise by an epic 445% since the November low reversal day. Price action has risen into resistance provided by the 1.618 Fibonacci Extension level (drawn in red) priced at $19.21 before pulling back slightly. The market trend is bullish but has been extremely overextended for the past few months. This gives us reason to believe that the FCT/USD market may need to pull back slightly before continuing higher. How Far Could the FCT/USD Market Retrace Before Continuing? Price action has already retraced toward support provided by the short-term .236 Fibonacci Retracement level (drawn in green) priced at $15.61. If the sellers continue to push price action further lower, we can expect more support beneath to be located at the .382 and .5 Fibonacci Retracement levels (drawn in green), priced at $13.33 and $11.49 respectively. If the sellers continue to cause FCT/USD to break back below $10, more support beneath can be located at the .618 and .786 Fibonacci Retracement levels (drawn in green), priced at $9.65 and $7.04 respectively. Could FCT/USD Continue Going Higher? Due to the overwhelming level of bullish momentum within the market, it will be no surprise if FCT/USD continues to travel higher instantly. In this case, the market will meet initial significant resistance at the previous 1.618 FIobnacci Extension level (drawn in red) priced at $19.21. If the buyers then continue to drive price action above the $20 handle, we can expect more resistance above to be located at the short-term 1.272 and 1.414 Fibonacci Extension levels (drawn in purple), priced at $21.61 and $22.87 respectively. Further resistance above this can be located at the 1.618 Fibonacci Extension level (drawn in purple) priced at $24.68. The rise of Factom over the past few weeks has been something that has been unimaginable within the industry. As the rest of the blockchain market collapses, Factom continues to make gains in a month that has been the most difficult in 2018. The buying will eventually stop at some point, but when is the key question. The momentum is still in favor of the bulls at this moment in time so it is highly likely that we could see Factom above $20 before the year concludes.